Found 4 file extension associations related to MindNode for Mac and 1 file format developed specifically for use with MindNode for Mac. MindNode is an elegant and simple-to-use mindmapping application for collecting, organizing and outlining your thoughts and ideas as mind maps. Mind maps can be used for many different tasks – including to-do lists, brainstorming, holiday planning, research, writing, project management - and in many different environments – school, meetings, workspace. New nodes are created directly on the canvas. There is no need to access the toolbar or the application menu. 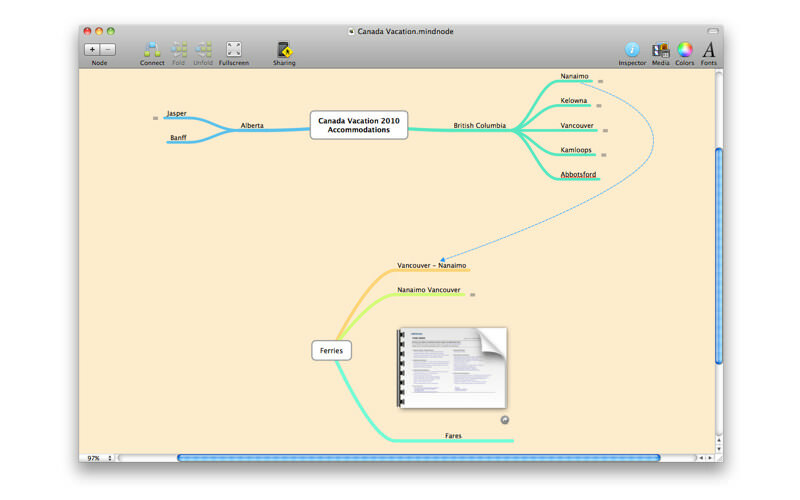 MindNode Pro features the ability to add images to topics and preview the content of a linked file directly on the canvas using QuickLook technology. Cross Connections are secondary connections and unrelated to normal branches. They allow to visualize a relationship between any two nodes on the mind map, which are otherwise unrelated. Folding allows you to hide subbranches to help you focus on other aspects of the mind map. Import and export documents directly from MindNode (touch). The ability to create multiple mind maps on one canvas makes MindNode Pro an ideal tool for brainstorming sessions. MindNode allows to automatically constrain the width of a node and to resize the node directly on the canvas. If you need more information please contact the developers of MindNode for Mac (IdeasOnCanvas), or check out their product website.